If you have students who are not participating in a recital dance with the class linked, you may remove them from the Dance. You will see all the students in the class. If a student is green, they are linked to perform in the dance. If a student is grey, they have not been linked to perform in the dance. They were added to the class after the class was linked to the dance. If a student is red, the student was unlinked and is not participating in the dance. To link a student in the class to participate in the dance, check the student box on the right and click the Link button. 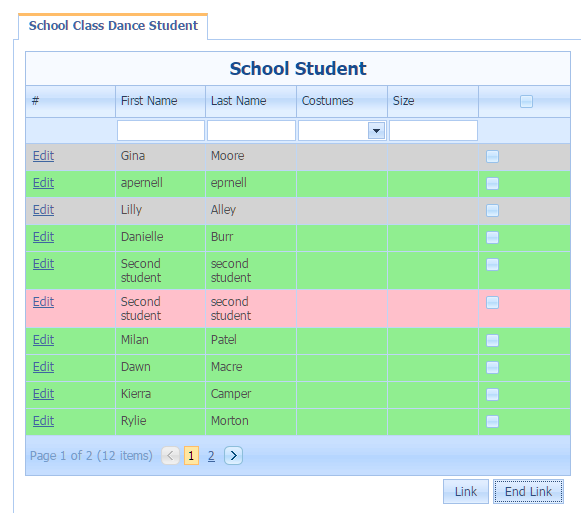 To remove a student who is in a class from participating in a dance, check the student box on the right and click the End Link button.